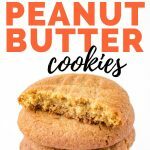 This chewy and delicious Keto Peanut Butter Cookie recipe will satisfy any craving for a low carb peanut butter dessert! 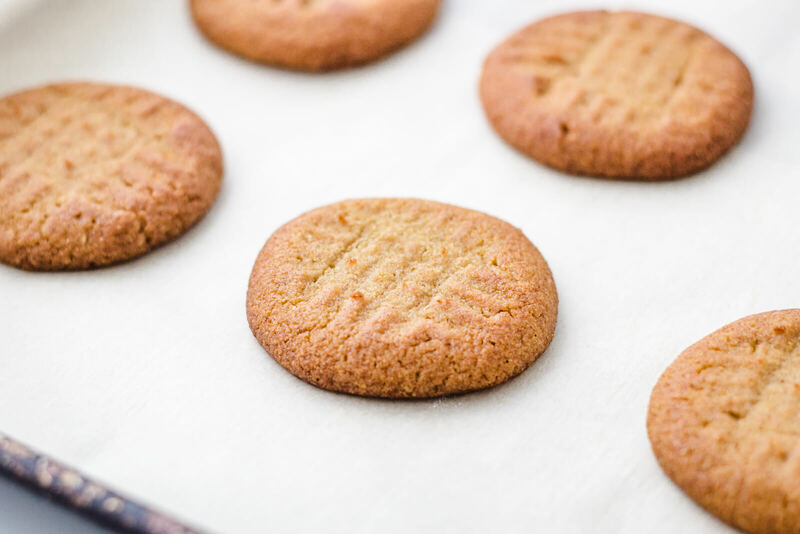 I’ve been dying for a soft and chewy low carb peanut butter cookie. 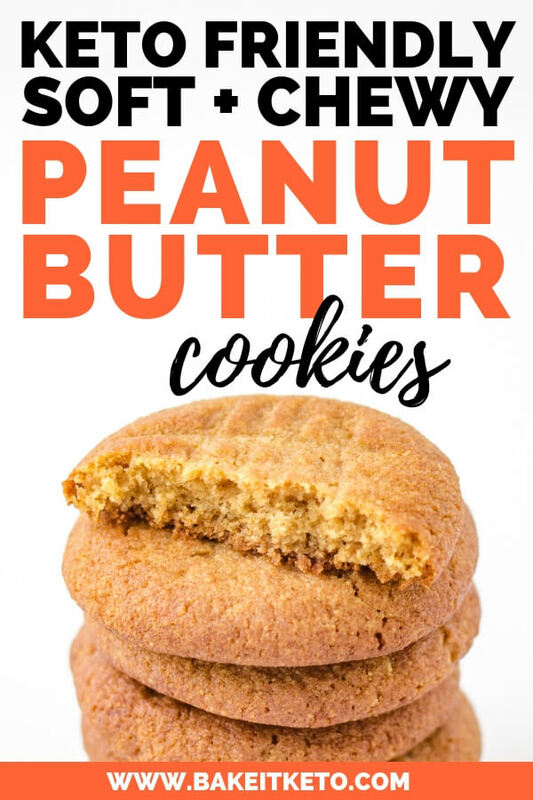 After creating my Keto Peanut Butter Cheesecake recipe, I had just enough peanut butter leftover to experiment with peanut butter cookies. Luckily my first version of this cookie recipe was just what I wanted, and I decided that I had to share it with you ASAP! Which Peanut Butter Is Best For Keto? Is there a good low carb peanut butter? And what exactly is keto peanut butter anyway? You might have realized that many brands of peanut butter have added sweeteners that sneak extra sugar and carbs into your diet. Personally, I also like to avoid extra, inflammatory oils like canola oil whenever possible. So I look for peanut butter that only contains peanuts, or peanuts and salt. I like this 365 Organic Creamy Peanut Butter. There are two key ingredients that help make these cookies super soft and chewy: allulose and collagen peptides. Allulose is a non-caloric sweetener called a rare sugar and as a Type 1 Diabetic, it doesn’t affect my blood sugar at all. It’s about 70% as sweet as granulated sugar. I love allulose because it caramelizes even better than sucrose, and it doesn’t recrystallize or become crunchy like erythritol sometimes can. And that makes it possible to make soft and chewy cookies! Since Allulose doesn’t ferment very much in the gut, it can also work well for those that experience digestive issues after eating erythritol. I like and use Hoosier Hill Farm’s allulose. Collagen peptides are super popular dietary supplement right now, but did you know they also add a little extra chewiness to low carb cookies? My favorite brand is Vital Protein’s Collagen Peptides. This cookie recipe is made using the creaming mixing method. That means that you will beat together the softened butter and sweeteners until they become light and fluffy (you’re actually creating tiny air pockets in the mixture that will later help the cookies rise when baking!). It’s super important to scrape the bowl down regularly with a rubber spatula to keep your mixture homogenous. Stand mixers do a fantastic job, but it just isn’t possible for the paddle to get quite to the side of the bowl. On my Kitchen Aid Pro 600, I find that the very bottom center of the bowl also needs a little extra attention. Next, you’ll add the room temperature egg, followed by the vanilla, and then the peanut butter. Take your time to make sure each ingredient is fully mixed in before adding the next, and keep scraping that bowl regularly! Once all of the wet ingredients have been combined, you’ll mix in the dry ingredients until they’re completely incorporated. Since coconut flour doesn’t contain any gluten, you don’t need to worry about making tough cookies by overmixing the dough or developing the gluten structure. Chill your cookie dough for about an hour. Now it’s time to scoop out the cookies and roll them in the extra granulated allulose. Don’t forget to add that signature crosshatch pattern to the top with the tines of a fork! These cookies take about 12-15 minutes to bake at 325 degrees F. They brown beautifully and evenly without much babysitting. Simply rotate the pans once, halfway through the cooking time. In a small bowl, combine the coconut flour, collagen peptides, baking powder, baking soda, salt, and cinnamon, and set aside. In the bowl of a stand mixer fitted with the paddle attachment, cream together the butter, allulose, and brown Swerve until light and fluffy. One at a time, add the egg, vanilla, and peanut butter to the butter mixture, beating to combine after each addition. Regularly scrape the bowl down with a rubber spatula. Cover the cookie dough and chill it in the refrigerator for one hour. Remove the dough from the refrigerator and scoop it into 24 equal balls. Gently roll each ball between your palms and then in the extra granulated allulose to coat. Using the back of a fork, mark the top of each cookie with a traditional crosshatch pattern. Bake the cookies for 12-15 minutes at 325 degrees F, rotating the pans halfway through the baking time. Allow the cookies to cool completely on the pan. Store in an airtight container.